Timeless and notoriously addictive, Tetris is a game you can go back to again and again throughout your whole life. A lot of people reading this will recognize it as a pioneer helping the masses warm up to gaming, and even more so in introducing the mainstream to dedicated gaming handhelds. 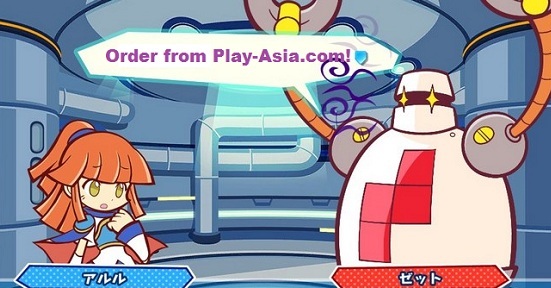 Puyo Puyo (called Puyo Pop internationally) is younger, but still a long-running series of puzzle-based joy that takes a minute to learn and years to master. Puyo Puyo Tetris delivers heaping helpings of the thing original gamers playing games for in the first place: pure, simple fun. Given the two games that form its foundation, how could it not? Puyo Puyo Tetris does more than simply squeeze the two games into one box and lazily expect the combined legacy to sell itself. 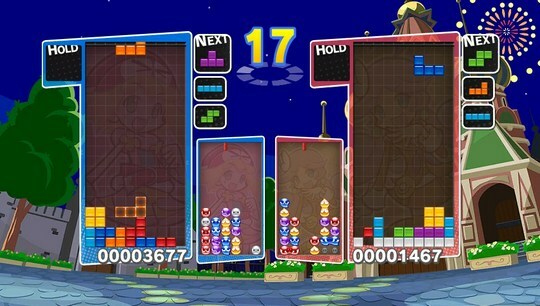 There are plenty of new modes, multiplayer matchups, and an all new game that combines Puyo and Tetris into one. There are so many ways to enjoy this. Play Puyo or play Tetris. You play Tetris while your opponent plays Puyo, or the other way around, or you can play the same game. My favorite mode is “Swap,” (pictured below) which switches back and forth between Puyo and Tetris at timed intervals. Link up combos to put the punishment on the other player. While not nearly as awesome as the originals (then again, is anything? 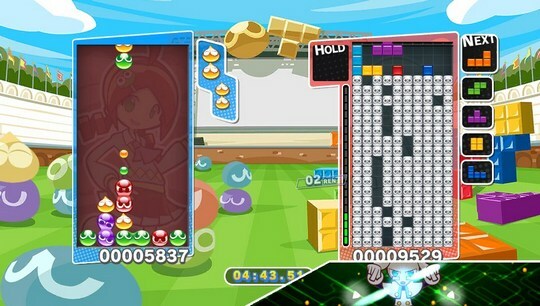 ), the combination Puyo-Tetris mode is a fun, worthwhile addition. In it, Tetris lines and Puyo blobs are formed in their usual ways, but they’re made to coexist to surprisingly functional results. Some things we think are impossible only because no one ever tried. It won’t be the reason to still pull this game off the shelf for years to come, but it makes for a respectable inclusion. Adventure Mode brings the worlds of Tetris and Puyo together by way of a nonsensical, over-the-top story. While it won’t have you on the edge of your seat, its humor might sufficiently entertain. But I don’t think too many people expected a riveting tale out of Tetris anyway, right? The mode provides a good deal of laughs and deserves credit for adding yet more fun to an already great collection of puzzle games. If the crazily over-acted voices annoy you, then hey, it’s not like skipping scenes or turning down the volume will rob you of critical plot details that will confuse you and greatly disturb your play. It’s a simple story that exists more for chuckles than to keep you on the edge of your seat, but it soon becomes obvious that a lot of thought went into this. You can’t make something this good and this clever without real passion and effort. As one goes along through this mode, story challenges arise that must be cleared before advancing. The challenge variety is impressive; thanks to this and the amusing characters, I found myself highly engaged in Adventure Mode. I’m guessing a lot of players will be like me and have decades of Tetris experience but only a little bit of Puyo Puyo experience. The two are similar, however, in that they don’t take but a few minutes to get the hang of, and the learning process is part of the fun. If your skill is slanted too much in one direction, you might have some trouble in Adventure Mode or online play, but honestly, screw it, I had fun even when I was losing. Again, it all goes back to the reasons these games are as enduring and as famous as they are: they’re just plain fun. To beat the best and to get through all of the challenges, you’ll need to develop high-level skills in both games. Opponents aren’t punished very severely by little one-and-two-line chipshots in Tetris, or little four-blob links by Puyo players; you’ll need to make with the big guns to survive, but I see this as a good thing. I was sufficiently satisfied with my Tetris skill before getting into this game, but hey, it gave me a reason to reach higher, and the challenge was fun. If all else fails, there are tutorials and training rooms to hone your skills if you get stuck in Adventure Mode or get sick of losing against friends. Multiplayer modes are available online and by ad-hoc linkups (the latter of which of course requires two copies of the game). On most days, I didn’t have much trouble finding opponents online, and the connection stayed stable. In ad-hoc mode, however, my wife and I ended up dropping quite a few games. There would be some nights that we could play without interruption; there would be others where every other match would disconnect. It was quite frustrating getting rolling, positioning blocks perfectly, getting ready to drop that straight block in for a Tetris when…oh, connection lost. Disconnections notwithstanding, ad-hoc play did provide many great nights of gaming. When it’s working, it’s great. (Tetris side) Gee, I wonder where I’m supposed to put this? Yeah, almost all of the puzzles for the Tetris side of Big Bang are like this. Occasionally you have some Puyo puzzles that scream with similar ease, but I find they number fewer. Why not include these preset puzzles in addition to the traditional dropping? It would have been so easy to add this option and fix this mode. Puyo Puyo Tetris is an example of a franchise entry done right. Its developers could have cut corners, but refused to; they could have slid by without the Adventure Mode, but didn’t; they went that extra mile to add value to the product. They could have followed too many other modern games and chosen either ad-hoc or online play and gotten away with it, but they included both. Big Bang was slip, but an understandable one and it doesn’t take away from the other, highly entertaining modes. Just like the original Tetris and Puyo Puyo, this is a game you’ll want to keep in your collection, because it will hold its appeal for years and years. Review copy obtained via Play-Asia.com. Vita version reviewed. Also available for PS3. This is one of the most easily importable games out there. You know Tetris, come on. If you don’t know the less-popular Puyo Pop, that’s fine; you’ll play it and figure it out. (And it’s mad fun.) You sadly won’t be able to get the funny dialogue of story mode without Japanese knowledge, but you’ll understand the general gist of what’s going on, as the voice actors and character portraits are all quite over-acted. Early Japanese learners might enjoy the hiragana-heavy script and fact that most dialogue is narrated by the actors. The menus are self-explanatory, though setting up online play might take some trial and error. I only use the Japanese PSN, so I can’t say if you’ll need to switch regions or not. I’ve played NA region games while signed in with my Japanese Vita though, so there’s that. 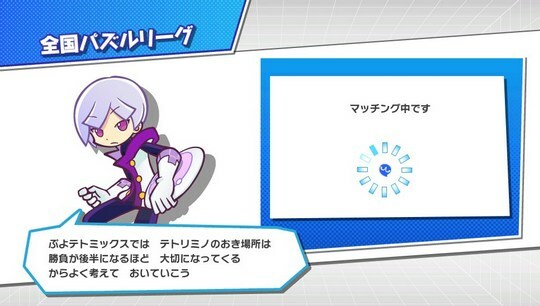 Puyo Puyo Tetris does not currently have any international release announcements. Whether it will is anyone’s guess. Tetris has an appeal in North America and Europe, but the last Puyo Puyo (Puyo Pop) game to go abroad was in 2004. You never thought this would happrn! What does "Happrn" even mean? 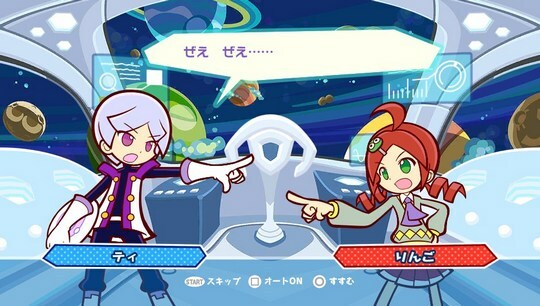 It means I don't fix typos anymore because Tetris and Puyo are together! Seriously though, jokes aside, this is fantastic. Frequent disconnections in ad-hoc mode. Big Bang Mode: good idea, terrible execution.